Carrots and quinoa are both ingredients that are really good for anyone with a sensitive gut. I saw a recipe for a carrot and quinoa cake by Rose Prince in the Telegraph’s baking club cookery column. So I decided to play around with the ingredients and see what I could come up with in terms of getting the flavours right and making this a very special cake. One thing I had to pay particular attention to was the topping. Most toppings for carrot cake involve a cream cheese type topping which I like but it wouldn’t do for this recipe because it contains lactose. Lactose is a fermentable carbohydrate which can cause symptoms in some people. The other problem with a cream cheese or mascarpone type topping is they contain a lot of fat and fat stimulates a gastrocolonic response, which causes pain and can generally upset the gut. It is also very high in calories especially when sugar is added to it. So I thought long and hard about how I could finish the top of the cake off. My rule in situations like this is to keep it simple. I routed through my cupboards and found some beautiful dark cooking chocolate which I though would be great to dribble over some sticks of home made candied orange peel I had in my fridge. Click here for a great recipe for making your candied peel. Carrot, orange and chocolate are all complementary flavours. To spice up the cake I added a little ground coriander, cinnamon and some mixed spice. The original recipe contained self raising flour and so I substituted this with a mix of ground almonds and gluten free self raising flour. For those of you who like me did not know quite what gluten free flour is made from I can tell you it usually contains a mixture of rice, potato, tapioca, maize and buckwheat flour, which are not only gluten free but low in FODMAPS. I loved how this recipe turned out. 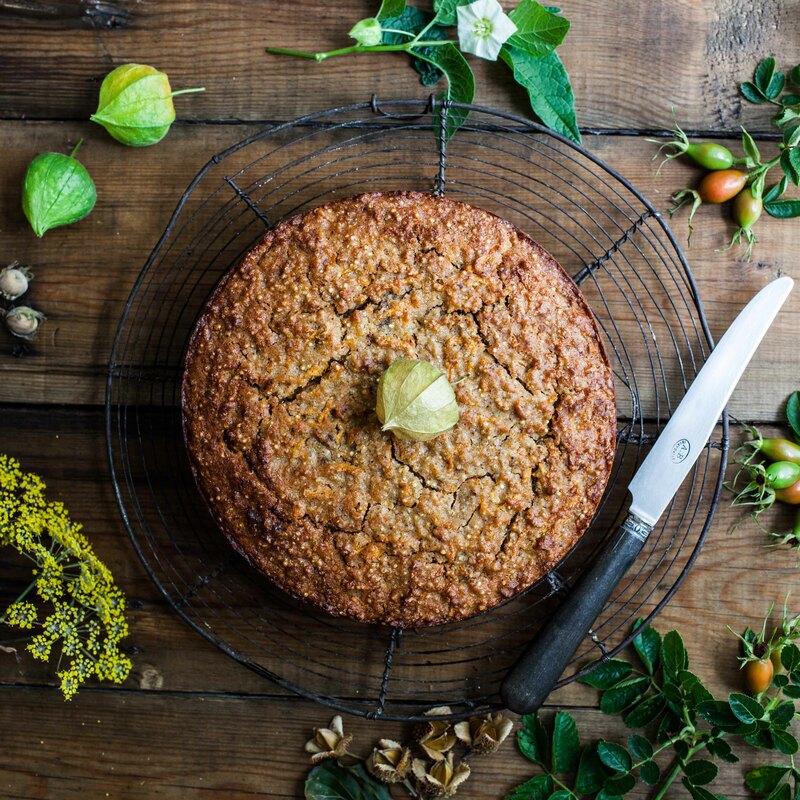 It is a large, moist cake, the flavour and texture of the carrots comes through and the nuttiness and crunch of walnuts makes it taste wonderful. I am really pleased with this. Quinoa is definitely a great ingredient to use in a cake like this. Preheat the oven to 180C/350F/Gas 4. You will need a spring form baking tin measuring 23cm/ 9 inch across with the base lined with buttered silicone baking paper. Place the dry ingredients (flour, spices, ground almond, walnuts and light brown sugar) together and mix thoroughly. Combine the oil, eggs and maple syrup and whizz together with a stick blender or a hand whisk. Add the wet mixture to the dry mixture and stir in the quinoa and carrots. Fold the ingredients together carefully until well combined. Spoon the mixture into the prepared cake tin and cook for 45 minutes or until the cake is just turning golden brown and is firm and springy to touch. Remove the cake from the oven and when cool enough release it from the tin and allow it cool completely. To decorate the cake: break the dark chocolate into small pieces and place in a small bowl over hot water and allow it to melt. 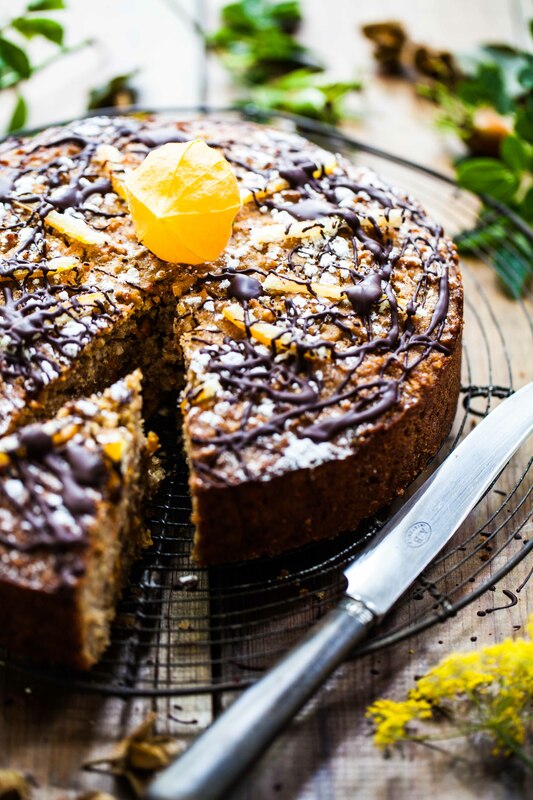 Dribble the top of the cake with the melted chocolate and decorate with either orange zest or candied orange peel. Or you could simply sprinkle the top of the cake with a little icing sugar. 14 Aug	This entry was written by Joan Ransley and published on August 14, 2014 at 1:07 pm. It’s filed under Pudding, Snack and tagged carrot and quinoa cake, carrot cake, cooking, dietetics, FODMAPS, gluten free, lactose free, low FODMAP, quinoa. Bookmark the permalink. Follow any comments here with the RSS feed for this post. Newer: Can I eat meat? Now, I can never be bothered to bake but if you are the kind of person who does… this sounds absolutely blooming fantastic, not to mention low-FODMAP friendly! Thank you ‘This box of mine’! Love your site.